Far-right parties have made considerable electoral gains around the world lately, fuelled in part by strong anti-immigration rhetoric. This column presents the results of an experiment conducted in Japan to assess whether exposure to positive information about immigration can decrease this public hostility. Such information exposure is found to increase an individual’s likelihood of supporting immigration by between 43% and 72%. This suggests that information campaigns are a very promising avenue for policymakers aiming to redress hostility to immigration. Immigration continues to be at the forefront of the political debate in many destination countries. Far-right parties have used a strong anti-immigration rhetoric to make considerable electoral gains in countries such as Austria (Halla et al 2016), France, Germany (Otto and Steinhardt 2014), the Netherlands, and Switzerland (Rydgren 2008). Acts of open hostility towards immigrants, racism, and even violence have increased sharply, and many public opinion surveys indicate growing concerns with immigration and unprecedented levels of opposition to it. What can be done to counter this antagonism? The answer is likely to depend on the extent to which people’s views on immigration are visceral – that is, rooted in strong sentiment that is largely impervious to change. Put differently, can exposure to information regarding the economic and social benefits of immigration decrease public hostility? In a recent paper, we tackle this question by carrying out a large national experiment in Japan (Facchini et al 2016). Our results indicate that exposure to information can in fact be effective in altering attitudes on immigration, even beyond the short term. Our results point to the promise of using information campaigns to reduce anti-immigration sentiments on a broad scale. Our study focuses on Japan, a country facing significant demographic and economic challenges as a result of low birth rates, a rapidly ageing population, and acute labour shortages in several sectors. Nonetheless, the Japanese government has so far resisted opening the gates to immigrants, at least partly because of widespread public opposition. The experiment we carried out was administered with a nationally representative sample of 9,000 individuals. 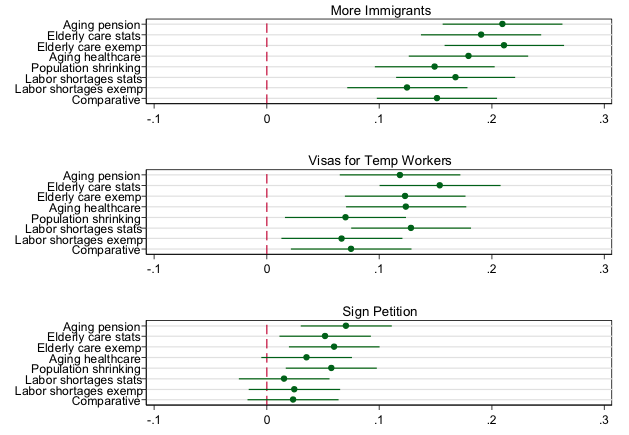 We sought to test whether exposing individuals to positive information regarding the potential economic and social benefits of immigration could lead to a shift in public preferences on immigration policy. To avoid social desirability bias or ‘demand effects’, the respondents were not informed of the study’s focus on immigration attitudes. Instead, participants were told that their task was to determine the suitability of texts for reading comprehension assignments in Japanese high schools. (To ensure a level of engagement with the assignment, respondents had to evaluate the text on a number of dimensions.) The two texts they were given were two roughly 200-word reports drafted to read like short newspaper articles. One article, about the lifetime experiences of a Japanese painter, was assigned to all participants. The control group was then asked to read a second article about recent discoveries on the planet Pluto; the treatment groups were handed instead a second text discussing a social-economic problem in Japan, which highlighted how immigration could help address the issue. To gauge whether exposure to this information had any impact on participants' attitudes on immigration policy, two thirds of the sample were asked upon completion of the reading comprehension exercise to answer a series of questions on policy issues, including on immigration. Participants in the final third of the sample (3,000 respondents) were not prompted with those questions. Instead, they were invited to take part in the survey only 10-12 days after completing the reading comprehension evaluation. The information treatments were divided into four broad groups. The first group was exposed to a demographic treatment, which sought to highlight the significant population shrinkage that is expected to worsen over the next few decades. The objective of this intervention was to make respondents think of the potential immigration has to mitigate the problem of a dwindling population. The second set of treatments focused on labour market shortages, emphasising the adverse effect of having too few workers in key sectors of the economy, and how migration can help in addressing this situation. The third group was exposed to the comparison treatment, which included information regarding the relative size of migration into Japan as compared to that of other OECD countries. We sought to examine whether eliciting conformity with the prevailing norm in other rich countries might affect the views of Japanese respondents regarding the desirable level of immigration. The fourth and final intervention focused on the role immigration could play in tackling population ageing and its consequences. Given the prominence of the issue for Japan, we devised three sub-treatments to highlight different aspects of the phenomenon: sustainability of the pension system, the growing need of long-term care providers, and an underfunded healthcare system. In all these cases, immigration was described as a possible way to mitigate the problem. In addition to the treatments discussed above, we also investigated how the information was conveyed, whether as a summary of statistical information or as part of a story about a specific individual (exemplar). We assessed the effects of those treatments on respondents' views on immigration using three questions. One question asked about general preferences on immigration policy (a ‘more immigrants’ indicator); another on temporary migration (a ‘temporary visas’ indicator), and a third on the willingness of the respondents to sign a petition in favour of increasing the number of immigrants (the ‘petition’ indicator). We dichotomised the responses for ease of presentation, whereby 1 indicated a more pro-immigration stance. The baseline results are illustrated in Figure 1 below, where we report the effects of each treatment, with the control group as the reference. The results are quite striking. First, consider the top panel – our analysis indicates that among individuals in the non-treatment sample, only 29% of the population supported an increase in immigration levels. By providing information on some of the economic benefits of immigration, we see a large, positive, and significant effect on individual opinions. This holds true for all treatments. Effects range between 12 and 21 percentage points, meaning that an individual who was exposed to an information treatment was 43-72% more likely to support immigration than an individual in the control group. A similar pattern was observed with respect to attitudes on temporary migration (central panel). Here, the baseline rate of support is higher, at 37%. Yet again, we find that the effect of the informational treatment is positive and significant in all cases, ranging between 7 and 15 points. This represents an increase of 18-42% above the baseline rate. In the bottom panel we report on whether, after reading the treatment texts, individuals were more likely to agree to sign a petition asking the government to increase immigration into Japan. Signing the petition required participants to divulge personal details. It is therefore not surprising that this ‘more costly’ measure elicited lower support levels than strictly attitudinal questions. Still, we find that having received information on the potential benefits of migration had an impact also on the willingness to actively engage in the political process. This was true in particular for individuals exposed to three out of the four treatments related to the aging problem, as well as for the demographic treatment. In relative terms, the effects were again quite large, translating to an increase of 39-53% above the baseline rate. Do these effects persist over time? Figure 2 compares the treatment effects of those interviewed shortly after the reading comprehension study and those interviewed 10-12 days later. 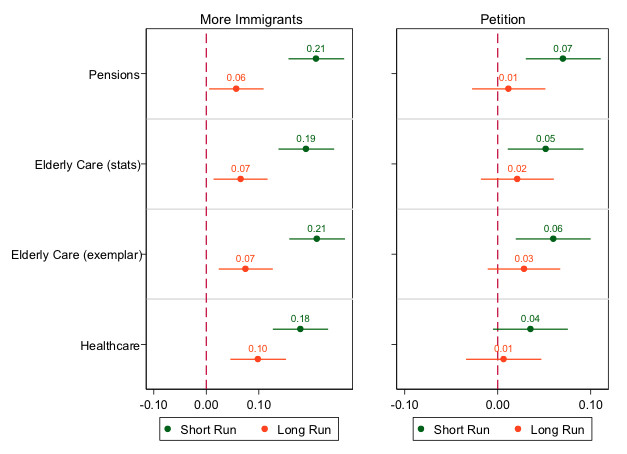 As both panels make clear, the longer run effect is consistently smaller than the short run effect, yet the treatments continue to have a large and significant effect on general attitudes towards immigration (left panel). The response on the quasi-behavioural outcome (the petition), while still positive, weakens over time and loses statistical significance. Finally, does the mode of conveyance matter? A large body of work on persuasion has debated whether arguments are more effective when presented through exemplars (e.g., personal stories) rather than in statistical terms. To weigh in on the question, we presented a couple of the issues in two different ways: one as a personal story, and the other as a dry statistical account. 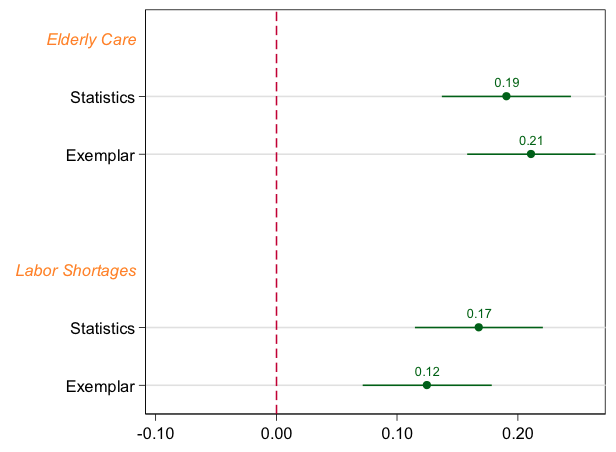 The results of our analysis – pertaining to labour shortages and the need for long-term care – are reported in Figure 3. As the figure shows, no clear pattern emerges. In one case the exemplar produces a slightly larger effect, while the reverse is true in the second case. Given the reluctance of politicians and organisations to appear invested in a lenient immigration policy, the public is rarely informed about potential social and economic benefits of immigration. Our results indicate that exposing people to information on these potential benefits can have a significant impact in shaping their views on the matter. This suggests that information campaigns aimed at the mass public are a promising avenue for policymakers interested in alleviating widespread hostility to immigration. For reasons we discuss in the paper, Japan can be seen as both an upper and lower bound case for testing the effects of information on public attitudes on immigration. Which of the two accounts is correct is ultimately an empirical question. Similar research should be undertaken in other advanced countries to help provide an answer. Facchini, G, Y Margalit and H Nakata (2016) “Countering public opposition to immigration: The impact of information campaigns”, CEPR, Discussion paper 11709. Halla, M, A F Wagner and J Zweimüller (2017) “Immigration and voting for the far right”, Journal of the European Economic Association, forthcoming. Otto, A and M F Steinhardt (2014) “Immigration and electoral outcomes: Evidence from city districts in Hamburg”, Regional Science and Urban Economics, 45: 67-79. Rydgren, J (2008) “Immigration sceptics, xenophobes or racists? Radical right-wing voting in six West European countries”, European Journal of Political Research, 47: 737-765. See Section 5 in Facchini et al. (2016) for more details. Professor of Economics, University of Nottingham and University of Milan and CEPR Research Fellow.